More likely than not, you’ve at some point received offers in the mail for duct cleaning services, promising to clear all sorts of dust and grime lurking within the airways of your home. But while these heavily-marketed bargain duct cleaning offers make a lot of promises, it’s important to do your research and see through the marketing before you come to a conclusion about what’s best for you. Gough Heating and Air Conditioning is here to help you make that decision, and to offer our superior services should you decide to go forward with duct cleaning. A lot of people ask us if air duct cleaning is even necessary, and that’s a fair question given the facts that your ducts are hidden away out of sight and you might not notice any problems. The last thing we want to do is pressure you into buying something you aren’t absolutely confident that you need—we want you to be sure that duct cleaning is the solution to your problem. The EPA’s fact sheet about duct cleaning is a valuable resource when doing the research and deciding whether or not your ducts need to be cleaned. Essentially, the EPA recommends duct cleaning if you or your family are experiencing unexplained illness or allergies, your ducts are infested with vermin such as rodents or insects, if there’s visible mold growth in the ducts or on other components of your HVAC system, or if the ducts are clogged with enough dust and debris that particles are actually being released into your home from the supply registers. Since a lot of your ducts may not be easily accessible for you to take a look at, Gough’s technicians will be happy to investigate them for you and discuss your indoor air quality issues with you before any work is scheduled, to make sure that duct cleaning is actually necessary and worth your time and money. Will My Home Get Dirty During the Vent Cleaning? 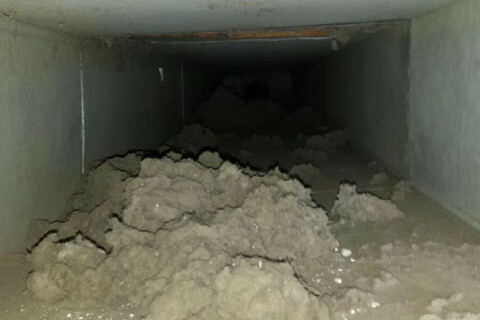 While leaving your ducts uncleaned can cause its own issues, far more dangerous are the consequences of allowing an inexperienced or incompetent service provider to improperly clean them. Quoting from the EPA factsheet, “if a service provider fails to follow proper duct cleaning procedures, duct cleaning can cause indoor air problems. For example, an inadequate vacuum collection system can release more dust, dirt and other contaminants than if you had left the ducts alone.” This is why it’s so important to be sure about duct cleaning and to carefully choose the right professionals to do the job, rather than jump the gun with the bargains advertised in those mail offers. The air duct cleaning equipment we use is designed to minimize disturbance to your home environment. Our collection system remains outside of your home with sealed hoses running indoors to perform the work, eliminating any chance of debris from your dusty ducts re-entering your home. Our crews are conscious not to track anything into your home, and we consider cleaning up after ourselves to be part of the job. You can count on the Gough Heating & Air Conditioning crew to provide a thorough cleaning of your home’s entire duct system, without surprise additional costs associated with not taking proper precautions. This will depend on the size of your home, but expect our two-person crew to be there for at least half of the work day to complete the job as thoroughly as possible. On top of that, there may be extra time taken to perform additional services you may wish to invest in. One such example is disinfecting your ducts. We can apply Sporicidin disinfectant solution, a mold-killing product commonly used in hospitals, to your ducts as an additional level of cleaning. 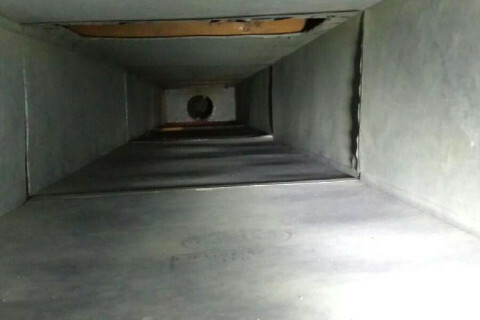 We offer this as an optional service, and would be happy to discuss this and other aspects of our duct cleaning services with you beforehand to ensure that you get exactly what you want.